No game is perfect. Well maybe except for Super Mario Brothers 3. In the last two posts I've been praising Tera but it's not without its shortcomings. That's it. These might be the staples of quest giving, but spending a few hours doing nothing but these quests can get a bit tedious. If you want to party with a friend(s) to have more fun finishing these quests the game penalizes you by cutting the amount of experienced gathered to a point where it becomes a negative. This discourages grouping in basic quests and the only time where parties are a viable option is in the dungeon instances. 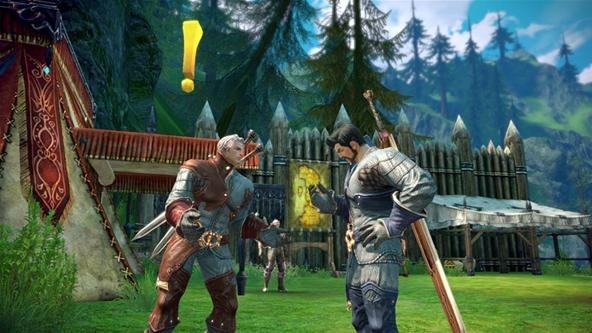 Just as it is hard to go back to regular MMOs after having experienced game play from Tera, it is hard to go back to a static world once one has experienced the way Rift actively makes the game more fun. Most people don't play MMOs to grind endless quests. They like a challenge, and to get this they fight special bosses and PvP while grouping with friends or strangers. In Tera, the challenges are sparse. The special monsters like Elites and instance bosses is not something that you run into every day, and most importantly, their drop rate is horrible. You can spend an hour killing a boss to only get a magic potion. PvP is not fully implemented yet. If you want to fight someone, you have to challenge them to a duel, so there are no sneak attacks or random murders. Most days in Tera just involve finishing quests after quest and then maybe after a few days you get to do an instance with friends. Just your typical day in Rift: Chaos central. In Rift, there is always chaos. In the game, there is always a danger or a challenge nearby. What the game does is open a random portal that must be defeated by the players. The monsters guarding the portal are stronger and harder than the regular monsters in the area, requiring a party to beat them. The beautiful thing about this situation is that the game knows the player needs to group, and in a chaotic situation there is no time to shout for one, so the game automatically groups you or makes it simple to join anyone that is nearby and start fighting right away. There are also random special group monsters roaming the roads, so that if you're not paying attention they will slaughter you. The monsters also siege small encampments, kill the quest NPCs, and take over the area. People need to work together to take it back and restore the NPCs or else people can't continue their story progression. All of this happens every hour and every minute of the game, not just once a week or on a special month. It's so easy in Rift to get distracted by a portal or helping others take a location back. This type of challenge is exciting and fun, because it breaks the monotony of the quest system. There are ho guild houses, guild central bank, player housing, general pets, fishing, etc.. These small touches often add a lot of value to MMOs. Lord of the Rings Online did it best with it's player and guild housing, making it a lot of fun to decorate and relax in your plot of land when you were done questing for the day. In Tera you simply stand there, homeless, with nothing to do but to go to the next location. You can't share things with clan members as easily as you could with other MMOs, and this is a serious setback. Guild planning and economic growth is very important, but in Tera the guild mostly feels like a friend list and nothing else. It's not all bad, good recap on what you can expect of Tera. Overall the game is worth trying out when it comes to the West. Besides its shortcomings, the game play is second to none at this point for an MMO. It's simply fun and exciting to finally play an MMO like an action game. The game is consistently getting new content to address these issues. Korea is getting a major content update this month that will revamp the end game content and PvP, along with other fixes and upgrades. Until Blade and Soul or Guild Wars 2 come out, consider giving this game a try.